Jo Moncrief, a successful self-taught artist and retired flight attendant, is one of many talented artists whose work is on display at The Artists’ Showplace Gallery. She is also one of our most popular workshop instructors. She spent 14 years as a thriving ceramic artist, and to this day, her acrylic paintings reflect her clay background. Moncrief's demonstration of 'wet pouring'. Moncrief is versatile in her works, expanding across realism, impressionism, cubism, abstract, and non-objective. She has an extensive knowledge of the elements and principles of design, and she strongly believes that it is impossible for an artist not to immerse a piece of themselves into their work. She describes that each contact with the surface of a painting is a decision, a move, a color added, a tilt of the canvas, and so on. A new technique that Moncrief has been exploring is a wet pouring of colors. This method allows for colors to explode, mingle, and blend. She sets each painting in a dark area for days, weeks, or months for precise study in different lightings. This helps her to determine any changes that need to be made. Upon completion, she seals her works in a UV polymer varnish that will protect the surface. Moncrief has received many prestigious awards for her work, in juried exhibits and art festivals, including “Best of Show”. 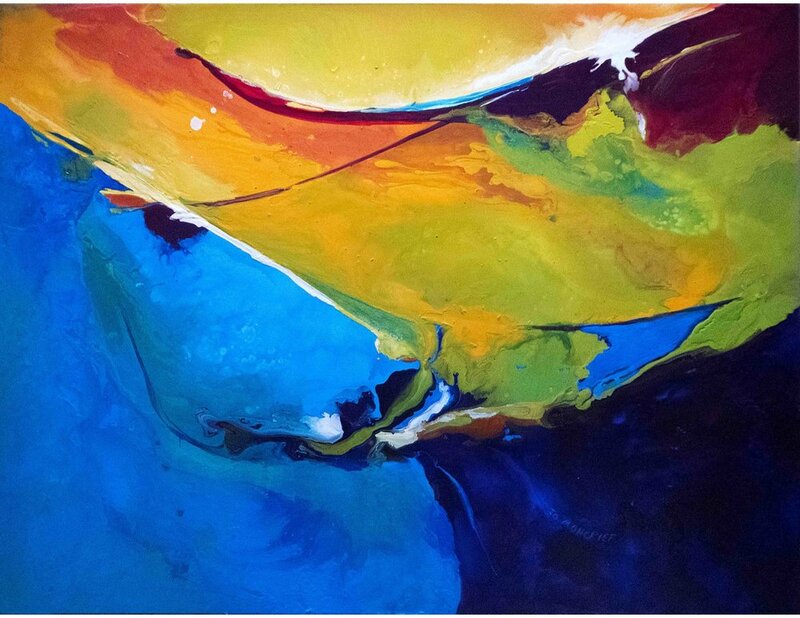 In 2016, two of her paintings were accepted into North Light Books’ fourth annual Best of Acrylic competition, “Acrylic Works 4: Captivating Color”. We treasure Jo as one of our distinguished workshop instructors and as part of the Artists’ Showplace family! Visit the “Classes and Workshops” or “Artists” section of our website now to learn more about Jo Moncrief and sign up for her next workshop by calling us at (972)-233-1223.